Wednesday is not from here. 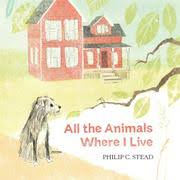 If you are a fan of Philip C. Stead's work you will have met Wednesday in a past book, Ideas Are All Around. This time, he shares his thoughts on living in a rural setting after living in the city. 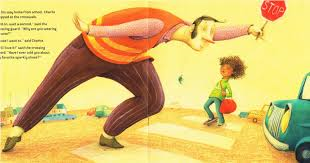 As he did in that previous book, he invites readers on a bit a a journey through the neighborhood. He is very content with this new life and, in sharing it with readers, it leads him to visit memories of his "Grandma Jane". gathering fluff and knitting it into a comfortable nest." His grandmother loved nature and animals and would very much enjoy a visit with his family in their new environs. Wednesday also loves where they are living now. There is much to see and to hear, and to consider as one day moves on to the next. "At night it is quiet. But only until you listen. There are a lot of little things playing their music in the moonlight. Then the coyote howls, and nothing moves." Seasons come and go. Wednesday watches, listens and protects as best she can. This is a peaceful meditative journey with an artist who sees wonder in the natural world, and shares it in details that are sure to engage and delight those who also love the feeling of calm in memories and observations shared. "I had lots of time to think in the closet, of course. It's like I was alone, but I wasn't alone at the same time. I made a home for myself inside my head and I decorated it with all the things I learned and thought about and made with my Legos. I got in touch with my inner Bobness! I know Livy feels awful about leaving me for all those years, but after that admittedly rocky adjustment ... "
It's been five years since Livy has been back to Australia to visit her grandmother. Now, she is ten. When she gets there, she has an intuition that something important is in the house. As she settles in to the guest bedroom, she opens the closet door and remembers what it is she forgot. It's Bob! Bob is “a small zombie wearing a chicken suit ...”. He is perched atop a large dictionary where, he is quick to tell her, he has been since Livy left him there five years ago when she returned home to Massachusetts. At the time, she promised to return and help him find his way home. Neither knew then where that might be. Bob is not impressed with how long it has taken for her to return. As the become reacquainted, Livy realizes just how special Bob is, and why she liked him so much from the beginning. He is loyal, kind, smart, and obviously, very patient. Memories from that first trip return, and a sense that a memory triggered might be the answer they need to send him home. Livy is worrying about missing her mother who will soon be off to visit old friends, leaving her with Gran Nichols. Gran is worrying about the drought that is threatening her town. Bob, though endlessly patient and still dressed in his chicken disguise, would really like to find his home and family. Will they be able to solve the mystery? 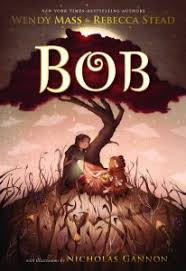 Will Bob finally go home? We can only hope. What a beautifully told this collaboration this is! That should come as no surprise given the wealth of talent for storytelling the two share. 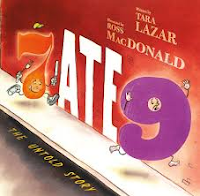 In alternating voices, they create a story of love, friendship and the beauty of a child's belief in magic. Each character is fully developed, and memorable. "When I saw you last night, something clicked. You really were Lady Crystallia! It was you, but you were more. Bigger. More amazing. You were like a goddess version of yourself ... it was magic. You know, I felt it, too! Something about wearing your dress transformed me. It's the first time I felt worthy of this." When Prince Sebastian meets Frances, he has no idea that his life is about to change. 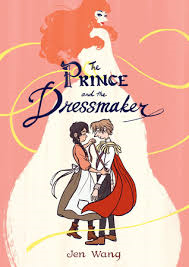 In a graphic novel, set in the late 19th century in Paris, and featuring a royal house, Jen Wang weaves a fascinating fairy tale that focuses on issues of identity, acceptance and prevailing tastes in fashion. Frances, a young seamstress, is tasked with creating overnight a new dress for a spoiled and dismissive young society woman. It is to be worn at the Prince's birthday ball. The dress is both scandalous and much admired; the following day Frances is asked to act as a personal dressmaker for a mysterious client. She accepts and soon learns that her client is none other than Prince Sebastian himself, who loves to dress in women's clothing. Soon, society is swooning over the beautiful fashions being worn by Lady Crystallia, Prince Sebastian's alter ego. The two become fast friends, and Frances promises to keep his secret. Sebastian is in a constant state of worry that his parents, and any potential bride, might discover that he likes to dress as a woman. He is an honorable young man, and doesn't want any scandal to reflect on his parents' regal position. Nor does he want any young woman chosen for him (although he is still very young) to be embarrassed by his alter identity. There is a hint of romance between the Frances and Sebastian, but the focus is mainly about their friendship. After meeting a long-admired fashion icon, Frances worries that she is not doing the work she is destined to do. She is suppressing her imagination and flare for design to Sebastian's needs, and not meeting her own. Although they bring out the best in each other, is it possible for the two to remain friends? There is magic in Jen Wang's elegant, colored illustrations. The fashions are unique and gorgeous, there is movement evident on every page, and the facial expressions are perfection. It is a fairy tale meant for a contemporary audience, and works beautifully. 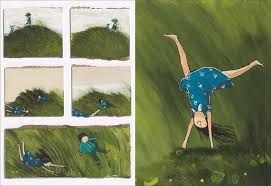 Her storytelling is impeccable, allowing readers to smile, weep, gasp and thoroughly enjoy this very special graphic novel. This is the first book that Matt James has both written and illustrated. I certainly hope it will not be his last. I am sure you have been to a family funeral with your children, and have wondered how it is affecting them. This is a very realistic portrayal of the few attended by my children when they were young. A death in the family is sad. There is no other word for it. We meet Norma a few days after a phone call reports the death of her mother's great uncle. Norma will not be in school today. She will attend Great-Uncle Frank's memorial service with her family. Norma is aware of funeral protocol, and is practicing her sad face. She knows she should be sad but, in truth, she is looking forward to seeing her cousin, Ray. He is her FAVORITE! All of this is vrty real for many young children. They have little capability to grasp the same meaning for death as happens with adults, especially when their experiences are few. 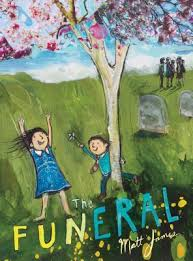 Norma sees the fun in funeral, as Matt James so aptly points out on the cover. She and Ray hope to have a chance to play at the church while their parents visit following the service. The service is presented with candor, and with its many elements - being in church, the back and forth between cousins before the long service begins, the unfamiliar sights and smells, the organist and the music, the refreshments in the church annex, the memorial photographs from Uncle Frank's life. Both children reflect on his life and Ray quietly asks, "Is Uncle Frank still a person?" Then, the two are released to the churchyard for time together - the fun part for them. Matt James uses mixed-media to create his impressive and expressive artwork. There are many poignant moments of both sadness and joy, reflected in a wide diversity of composition and perspective. I have read it numerous times, and find something new in the art every single time I do. Detailed and lovely, it is testament to Mr. James' great talent. Readers can see that Norma understands the solemnity of the service, while also exhibiting her own lively nature. Once she and Ray have the opportunity to be alone on their own, they do have a great time. Those images are filled with color, joy and exploration. I think he presents a perfect portrayal of a funeral from a child's perspective and the varying reactions of all those in attendance. "I think Uncle Frank would have liked his funeral." is doing right this second. a tent. Ah, never mind. Duck and Bear are back, and I couldn't be happier! I love reading these books, and kids love hearing them. I was recently reading at a K-8 school that I have been visiting every year for a while. In fact, this year was the tenth anniversary of my first visit there.That means that some of the kids have been there every year since I started. It is lovely to be with them, and hear their comments about years past. When I pulled out this book to read to the grade 7/8 class, there were fond remembrances of the first two books. When I asked for a descriptor for Duck, the answer came quickly ... annoying! Yep! Duck is annoying. His daily visits to the sedate and solitary Bear next door can certainly cause consternation. Duck doesn't change, and Bear adjusts. 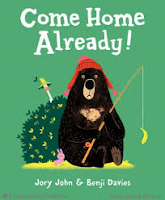 So, when Duck makes his daily ebullient trip over for a visit, he is stopped in his tracks by a sign on the door reporting that Bear has gone fishin' and will be back in a week. FISHING! How could Bear go without telling Duck, without asking him along, without considering how lonely Duck will be without his friend. Bear is beginning to rethink his fishing trip. It's hard to set up his tent, it starts to rain, the fish aren't biting, and he's hungry! With Bear sighing about his troubles, and Duck sighing over his missing friend, Duck makes a decision that is sure to change the trip entirely. The characters are polar opposites, the drama always perfect for reading aloud, and the expression-filled illustrations laugh-out-loud funny. They perfectly complement the writing and make this a duo readers want to meet again and again. 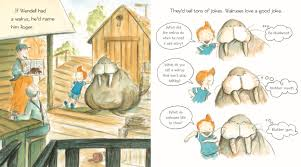 Thanks to Jory John and Benji Davies for perennial favorites! One day while out riding his bike, Wendell takes note of a walrus-shaped cloud. That gets him thinking about a real walrus, and that he might like to have one. Should he find one, he has the perfect name for it - Roger. They would share a love of jokes, the 'punnier' the better. They would surprise Mrs. Quimby as they sped past her garden, Roger being pulled in a wagon by Wendell on his bike. Some of his imaginings fall flat when he remembers that walruses can't climb trees, build forts without incident, or fly kites. No matter. They would love being together, and spend as much time as possible having the time of their lives. But, Wendell doesn't have a walrus. Maybe Uncle Zed's Pet Emporium has one for sale. 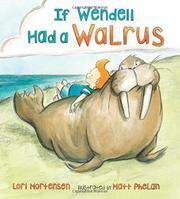 So, Wendell stuffs a note in a bottle and launches it into the ocean, asking any walrus to come visit. What he gets instead is a new friend! Matt Phelan uses pencil and watercolor to create the warmth and energy of the setting, while also ensuring that the humorous encounters between the walrus he wants to have and Wendell himself are lighthearted and engaging. The final image is a real hoot! "My tree is crying. I'm trying to cheer it up," said Albert. "Well, when I'm sad, I eat grass," said Caribou. So Albert and Caribou gathered lots of grass. "We've brought you some grass, Tree," said Albert. "Please cheer up." But the tree just kept wailing. Why is your tree crying, Albert?" said Squirrel. "I don't know," said Albert with a sigh." Seasons come and go, and there is much to like about each one of them. We all know bears sleep in the winter, and awaken in the spring with a need for food and perhaps even friendship. Albert is no exception. 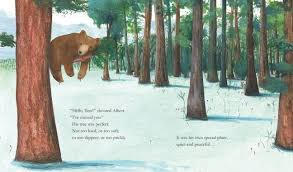 In spring, he races to his favorite place in the forest - his tree. Albert loves its branches, its beauty, its secluded spot and its serenity. Perched on its most comfortable branch, Albert is suddenly aware that there is a noise coming from his tree. It is crying ... no, wailing! 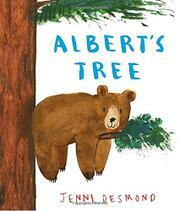 But, everything about the tree is just as Albert remembers it. He begins to inspect it from every angle, and remains puzzled by the noise. Rabbit hops up, with a question and a suggestion. Might digging holes help? Nope, the crying does not cease. Caribou wonders about grass. Grass always makes Caribou happy. Second failure! The tree just keeps howling! Albert begs it to stop. Nothing helps, until Albert thinks about what makes him happy. He asks a whispery question, and the tree is finally able to explain why it is sad. "Because I'm scared of the big hairy monster." Only then does Bear realize that their is another creature in residence in the tree with a reasonable fear, and he knows just what to do. Artwork is created in mixed media, and makes for a grand read. The endpapers offer up a special treat. Jenni Desmond's use of texture, white space, and bold color keep readers in constant contact with the soft, gentle bear that is full of love for his tree. You just want to reach out and give him a hug. My grandgirls are going to love it! Where is his secret lab? Only one agent can protect the humans from alien attack. His partner Binky has been captured, calls to P.U.R.S.T (Pets of the Universe Ready for Space Travel) have not been answered, and the humans need help. Is Gordon too late? There is no time to test his new time machine to ensure it can do what it is designed to do. He will have to take a chance, go five days back in time, and attempt to thwart the contemptible flies wanting to make his humans' lives unbearable. A 'bug' in the machine causes him to go back FIVE YEARS. Is there nothing to be done? He has no fuel to get home, he can't change what has happened because of its effects for the future, and dogs are the enemy. Can a dog do what needs to be done to change the future? You may be missing Binky, but Gordon certainly helps ease that pain. We are constantly aware of Gordon's thought processing and decision-making, as well as his occasional senior moments - balls and steak can be real distractions. Gordon must depend on his mental acuity to find a solution. Can he do it? 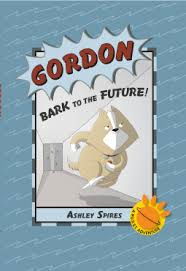 Laugh-out-loud funny, witty, full of action and angst, kids new to the series will want to go back and find all books that have led Gordon to this time in his life. Emerging readers will love it, fans will be thrilled to have another adventure to enjoy, and all will look forward to the next installment. "The first time I crashed a new school midyear was a disaster. The second time was ... well, okay, that was a disaster, too. By the third time, I started getting the hang of it. I guess that's one of the reasons the marshals picked me - I've done this sort of thing before. Granted, not as Charlotte Trevor, and not with people's lives at stake, but I know enough by now to have a plan ... "
I read a review of this novel, and knew that I wanted to read it. Thankfully, I did just that - and in one day! I only hope to meet Nicki and her new family at some future date, to see how they are doing. Nicki is a foster kid, with some issues. The Trevors are a family in need of help. The U.S. marshals are taxed with putting the Trevors into the Witness Protection Program, and finding a way to keep a deadly crime organization from finding them. What if they change the family composition, move them to a new home, and let them start over with Nicki/Charlotte as their daughter? What could possibly go wrong? Nicki/Charlotte is an crackerjack character - abrasive and charming, a pick pocket when nervous, thoughtful and kind, and looking to be loved. She is 13. Her life can only get better, she hopes. She does her best to maintain a quiet, inconspicuous life and keep her new family out of trouble. Her relationship with her new 'brother' is funny, and often contentious. Her past is not particularly conducive to her fitting in, but she does. The Trevors love her and value the help she gives to keep them out of the public eye. She does nothing to make herself visible. She's not nearly as cool as she really is, she gets average grades, she makes few friends, and she doesn't do as well as she could do at basketball, even though she could be fantastic. Flying under the radar is not easy; it takes a lot of work and diligence to keep it that way. Nicki's first person narration is powerful and strong, real and endearing. You will be happy to meet her. The pace of the story is quick, the bonds are strong, and there is a lot of fun mixed with the frightening chance for revenge if they are found. The ending is powerful, and will have readers hoping Jake Burt has another great story to tell. "The wind starts to stir. The family has gathered to have a cool drink together on a warm summer day. Two children can't ignore the allure of summer freedom and are off to explore the countryside. Away from the yard, down the path past the well, and through the meadow they run. Realizing they are a distance from home when a storm blows up, they must make a mad dash for safety. As they go, they continue to take note of their beautiful natural surroundings - a creek, a waterfall, the nearby lake and the meadow. "Our soggy shoes squeak when we race through the door. We crowd by the window and watch the rain pour." I like the way the author weaves common colors through the entirety of her verse. The pace picks up quickly as the children notice the dark gray clouds and run home, in contrast to the drowsy and relaxed pace at the beginning while the family enjoys refreshment in the summer heat. Readers will enjoy the setting, and the day's action, noting the many affable details included in Zoe Persico's lively digital artwork. It will strike an agreeable note with little ones as they enjoy the rhyme and rhythm of the text, and their introduction to the colors in this wondrous world. "Sometimes bats enter buildings through tiny holes or gaps that lead into attics, basements, or spaces between walls. People often want them removed, but if pups are present, the bats should be left alone until the pups have weaned and both females and pups have left for the season." 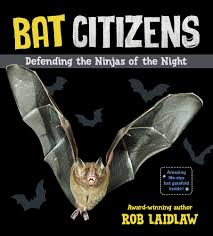 Young readers love knowing as much as they can about bats. Rob Laidlaw writes terrific nonfiction on topics that kids love to read. It's a win-win situation. No one will be disappointed when sharing this new book. Rob's writing style is conversational, and personal. He provides clear information, based on up-to-date study and creates a book that is perfect fare for his target audience. He begins with a useful table of contents, one of the features I like to see to help kids find what interests them most. There are five main sections: It's A Bat World, Unbelievable Bat Biology, Bats for a Healthy World, Bat Challenges and Solutions, and finally Being a Friend to Bats. The introduction is concise, offering a quick look at what we can expect from the book. A number of topics are covered in each section. These are far-ranging, and accompanied by numerous photographs, "Bat Facts" and "Batty Ideas" boxes to add appeal and enhance learning. 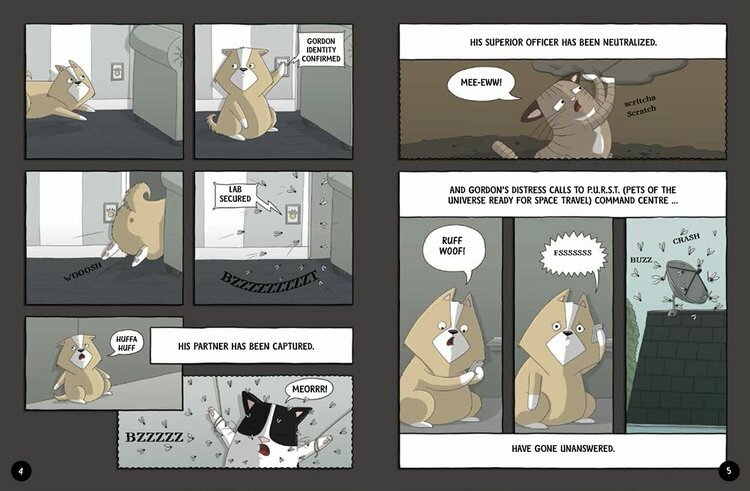 "Bat Citizens" are frequently introduced with text explaining what each does to improve conditions for the animals they love. "Maternity roosts are where female bats gather to bear their young. the loss of body fluids." On the facing page we learn about Dara McAnulty, a 13-year-old Irish conservationist "who does whatever he can to help bats and other wild animals. Dara blogs about bats, his own wildlife sightings and research, and his thoughts about wildlife conservation. He constructs bat boxes for local gardens, schools, and other organizations. He also goes out with a local group to do bat detecting, and he contributes his findings to a database that helps scientists studying bats." Pretty admirable stuff! And he's not the only one. I counted 11 entries for Bat Citizens. Worthy work they are doing for bats, for scientists, and for our planet. Kids will enjoy reading about their work, and thinking about what they might do to make the world a better place. Impressive and well-researched, as are other books by Rob Laidlaw, there is much to like about this fine book. "That was when I saw him. edge of the tree house. The narrator for this backup bunny story is the backup bunny himself. Fluffy lives in a sock drawer, ready to save the day should Bunny ever go missing. Fluffy has happy dreams about what it will be like when he must spring into action. Finally, Bunny is lost and Max is inconsolable. It's what Fluffy has spent long hours imagining. At first, Max seems content. "Max squeezed me. He pressed me to his cheek. He petted the tips of my ears. For a second, I was truly happy. Max does accept Fluffy as an acceptable substitute for Bunny. They eventually begin to do things together. All end with Fluffy in some untenable position that requires time on the clothesline. There are moments of hope, but bedtime comes and Bunny is called for, not Fluffy. Feeling great guilt for knowing where Bunny is and not saying anything, Fluffy finally spills the beans. Bunny is found and Fluffy returns to the sock drawer for good. Or, does he? Fun, fun, fun! Greg Stones gives Fluffy a warm countenance. Feelings are fully on display from start to finish. Humor is clear, and appreciated as Fluffy must endure less that perfect treatment. 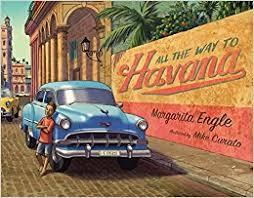 by the seawall, ... "
I was very interested in seeing this book, although I have never been to Cuba. My husband, a high school coach and hometown baseball player, visited in the early 1970s as a member of the Canadian national baseball team asked to participant in a tournament held there. He was enamored of the 1950 era cars that were so lovingly cared for by their owners. When I saw this book, written 45 years later and focused on one particular car, I knew how he felt then. Today Cara Cara sounds like a tiny baby chick. The car stops, Papa does some more tinkering, and keeps trying until finally they are back on the road. The car fills with others in need a lift, the family, the gift and the cake. Upon arrival in Havana, the boy notices many cars similar to their own. The family party is enjoyed, the trip home uneventful, and further attention must be given the next day to the lovely Cara Cara. A lively telling and incredibly realistic illustrations take readers to the heart of Cuba. I am a huge fan of Margarita Engle; I love her storytelling. Mike Curato has done his homework. In fact, he did his research on a trip to Cuba. Using artwork created in pencil with digital color, readers are drawn to the brilliance of the island colors. The landscapes are detailed and authentic, the street scenes vibrant and full of life. The cars are perfect, allowing readers to see the variety, the mixing and matching that takes place to keep them in running order. Their cars are as resilient as the Cuban people who keep them running. This celebration of Cuban life will entertain and attract many readers. Notes from both author and illustrator are welcome. That everyone has their own way of looking at things and people. That each person's way of looking is made of where they're standing ... "
The bullied child is our narrator. Bully B. manages to make life miserable every school day. The text is to the point, the headlines bold and telling. Unsure how to get help, the vulnerable child expresses feelings alone and to readers. Swishes right past me like I'm invisible." Mom sees the sadness, but there is no explanation for it. She suggests a walk. The two have fun, lying on the grass, talking about the vast blue sky. Upon the return home, the child looks at favorite books, considers a real love for Earth and life on it. And wishes Bully B. were an inhabitant of far distant star. 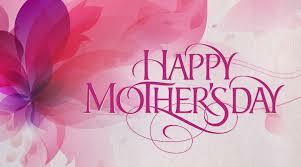 Finally, the courage comes to share with EVERYTHING with Mom. Mom tries to explain that everyone has their own view of the world that comes from circumstance, and Bully B. only sees the differences between the two. She offers advice and a few solutions for changing that perception. One takes special courage. It's worth a try, isn't it? Can they come to some sort of understanding? If the solution to bullying were easy, we would not have to keep discussing it. Books can make a difference in the way children perceive its causes. Empathy for others is a perfect place to begin thinking differently. Carey Sookocheff creates characters that are just slightly hazy in appearance. The main character is blue, the bully green and the rest of their world largely without color. Only when a cautious truce results does the world become more colorful and vibrant. A chicken is an unexpected birthday gift from Abuela Lola. Ana was hoping for tickets to an amusement park. She may be disappointed, but she handles the situation with aplomb and good grace. Abuela might have gifted something even less attractive. Besides, she likes scrambled eggs! The chicken is as unexpected as the gift itself. It has no time for chicken feed. Well, candy perhaps. It has no time for laying eggs. It does have an elongated list of needs. Kids will giggle when the list is read - 100 steel girders, 10,000 screws, 60,000 nails, an old lady who swallowed a fly, a hammer, a digger. That is only the beginning. Ana takes the list to heart when she sees her chicken has a plan. The plan requires assistance from Ana's other pets: her dog has no time for a walk, her cat has no time to play, and her hamster is busy driving the excavator. The chicken recruits countless other animal friends and asks Ana for help as well. First, the chicken wants her to call Abuela Lola and ask her to pack her bags. There's a bonus! The birthday gift results in a birthday visit from Ana's much loved grandmother. She arrives in time to see the chicken's plan come to fruition. What a plan it is! Mixed media artwork is as playful as the text is pragmatic. Bold color, clever details, and full out action will have kids giggling at every turn. Be sure to take the time to read the chicken's entire list! "Hold on, wait a second," said Charlotte, who sat next to him. "Why are you wearing a purse?" "'Cause I want to," said Charlie. "But you're a boy! Boys carry worms in their pockets and toads in their backpacks, not bright red purses!" said Charlotte. 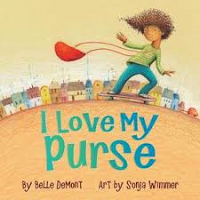 "But I love my purse," said Charlie." Charlie has a purse from his grandmother. It is red and lovely. With its strong handles and wealth of space, Charlie can carry as much as he wants to carry. He loves his purse. No longer will it sit in the closet. His father tries to dissuade him from taking it to school with the argument that boys don't carry purses. Charlie does! His friend Charlotte has much the same attitude. Charlie listens to her opinion, reiterating that he loves his purse. Older boys also have something to say, but Charlie sticks to carrying the purse he loves. Even the crossing guard notices. Turns out he loves the purse, too - and his own sparkly shoes. Charlie is just fine with his decision to take his purse to school every day. Those who wonder about his choice voice their opinions, and Charlie listens. But, he loves his purse and that makes carrying it easy for him. I really appreciate the way Charlie's determination inspires his father, his friend Charlotte, the older boy Sam, and the crossing guard to make a changes that make them happier. wearing your suit, Dad?" asked Charlie. "I love this shirt. The world needs to see it!" "You don't think your boss is gonna get mad?" owning this sweet shirt!" said Charlie's dad." Bazinga! Kudos to Charlie for his non-conformist ways. 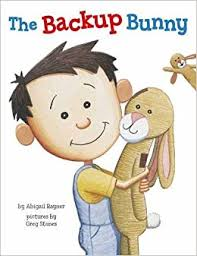 We could all take a lesson, and teach a lesson by sharing this book with our kids. "The fans at Arizona State have a "curtain of distraction." This is an actual curtain set up near the opposing team's hoop. Just as a shooter gets ready to let go of the ball, students open the curtain. They've revealed everything from dancing unicorns to US Olympic swimmer Michael Phelps dressed in a Speedo and wearing all his gold medals." We are already into the second round conference playoffs in the NBA post season. With baseball season in full swing, hockey playoffs ramping up, and basketball games to watch, sports fans are in a conundrum for what to watch and when. We have always been a sports family. So, it's a great time of year to be distracted from everything else, and take time to sit and watch our favorite teams play. Having just finished reading Kevin Sylvester's book about basketball, I am more informed than I have ever been. I thought I knew the game pretty well. This book is full of facts, figures, rules, plays, stories and minutiae. There is much I did not know. If only, I could keep it all straight in my head! Written and illustrated by Mr. Sylvester, it takes the same form as his 2015 Baseballogy. A clear and extensive table of contents invites browsing through its many double page entries. An introduction reminds readers that basketball is its own entity. It was not developed from any other sport. There have been changes, and the love for the sport has certainly grown. Remember that they had started by nailing peach baskets onto the balcony around the gym floor. With each turn of the page, information is added about the changes that have occurred in balls, rules, court size, the art of dribbling, the shot clock, and players' skill development. 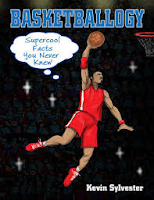 With appealing artwork, charts, graphs and pages filled with all the basketball information enthusiasts are happy to know, you can not go wrong having this book available to kids who love learning about sports. The author covers facts and stories from the WNBA; addresses questions of salary, TV ratings and attendance, equity, diversity and ownership, and so much more. The most interesting - and astonishing - comparison concerns the cost difference in attendance from 1960 until today. Anyone who attends public events is aware of the enormous changes that have been made and continue to happen. Kids seeing those money differences from spread to spread will be wishing for a return to common sense. A ticket then? $1.50 and $4.00 courtside. Basketball was no big deal for many in 1960. Today, a ticket is $40 and courtside is $2,000 for one game! Concession food can set you back another pretty penny when a soft drink is $6.50, compared to 20 cents then. I would bet that 20 cents is much closer to what the concession stand buys it for even today. Backmatter adds The Original 13 Rules penned by James Naismith in 1891, a trivia test (and answers), references and further reading, an index and a note about the author. "Do you carry a backpack to school? If you think about it, a backpack can hold almost everything we need to survive and communicate: water, food, clothing, paper, and perhaps an electronic device. In every chapter of this book (except when we visit outer space) we're going to take a look at something you might carry in your backpack to school. We'll see how it is produced ... "
In doing so, we will also learn what happens when those items become waste. What happens to water, paper, food, plastic, metals and electronics when we are finished with them? Common items that kids carry with them go through many different stages of development before being used or thrown away. If we take a look at the 'stuff' that surrounds us, it is everywhere. Spring cleaning forces us to look carefully at what we have collected and kept over the past year. It can be overwhelming. 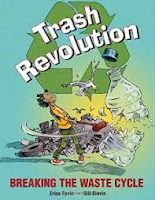 As the author discusses the waste cycle, she helps us understand that each and every one of us has a role to play in reducing waste because the world can no longer endure the ever-growing piles that threaten our world. It will take a lot of thought and hard work to decide how we can make simple changes, and tough ones, to ensure the future of the planet. There is a lot of information to process, but it is written clearly and coupled with terrific illustrations that help with understanding and access. The table of contents is useful for readers in determining what they would like to learn about first. I was interested in two: paper and plastic. "Worldwide, approximately 270 000 trees are cut down every day for paper production. Ten percent of that is for toilet paper. According to the Toilet Paper Encyclopedia (yes, it exists), 49 percent of people would choose toilet paper as their one desert-island item. Toilet paper ranked higher than food! The same study told us that the average person spends three years of their life on the toilet. That's a lot of paper. (And a lot of time.)" "Globally, we use 4 billion plastic bags a year. We use them for an average of 12 minutes, but they take 500-plus years to decompose in a landfill. They were first introduced into supermarkets in 1977. So that first bag may be gone by the year ... 2477? Most plastic bags won't decompose (biodegrade) easily because the polymers in them are not recognized as food by microorganisms and they won't eat them." Where will I start - and what about you? An introduction, glossary, index and list of resources to provide even more information for those interested are included in backmatter. Bill Slavin provides a touch of humor in illustrations that both inform and instruct. Charts and sidebars are well done and very useful. 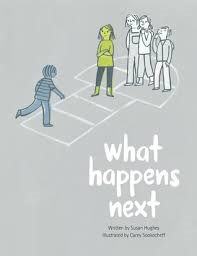 I think it is a book that should be in every school classroom and home. Only by informing ourselves and reducing the amount of waste we create on a daily basis can we be part of the solution. Shouldn't we all take responsibility? Isn't it up to each individual to play a part in reducing the footprint we leave every single day. Start with the easy stuff, and work up to bigger things. Do it at school and at home. It will help make the difference we want to see in the world. "Ida Lewis's father was the Lime Rock lighthouse keeper in Rhode Island. The only way to get to the lighthouse was by boat. Ida loved the water and wanted to tag along. That meant she had to learn to row - and she did. Ida soon became as comfortable in a rowboat as she was on land! When she was fifteen, the family moved into the newly built lighthouse on Lime Rock." It wasn't long until her father's illness put Ida in charge of the lighthouse. Dropping out of school, she did what she had to do to keep the lighthouse running. She also rowed her younger siblings to school and back every day. Her first sea rescue happened when she was only 16. In the 54 years she spent in the lighthouse, she was credited with saving eighteen people! No one really kept track. The lighthouse at Lime Rock has been renamed to Ida Lewis Rock in honor of her many accomplishments. The people of Rhode Island may know this story, but I am betting that there are many who do not. That is what I appreciate about reading books that teach me something new, and offer stories that are not familiar to many. I am guessing most of the 52 women included here are not well-known to readers, including adults. I recognized nine names. 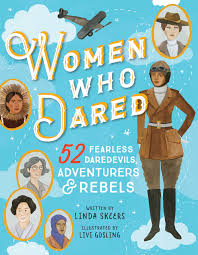 Divided into three sections - daredevils, adventurers, and rebels, and dating back to as early as 1740, each short biography is presented on a double page spread that includes a colorful illustration facing a page of text providing the pertinent details for so many lives well-lived. Most lived in the 19th and 20th centuries, while a few are still with us today. Each is given a descriptor prior to the short biography. Ida Lewis's is Lighthouse Keeper and Life Saver. These women were ahead of their time, working at endeavors few other women had thought to tackle and doing amazing things. Each is fascinating in her own right and will provide inspiration for those who read their stories. Those stories are compelling and will encourage young women to try their hand at unexpected ventures. Be like Keiko Fukuda who chose martial arts over flower arranging and tea ceremonies, or Bessie Stringfield who flipped a coin to determine where she would next visit on her motorcycle, performing stunts at carnivals and fairs to further her travels, or Emma "Grandma" Gatewood who hiked the Appalachian Trail for the first time at 67 - and then did it again 2 years later! They are terrific role models and worth knowing. One new worthy women for every week in an entire year - there's a goal to have. Wouldn't it be something to learn all you could about each one? An extensive bibliography is included, as well as an index of the names of each of the women presented here. 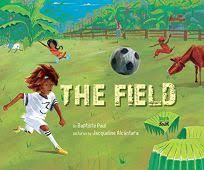 Any open field can provide hours of fun and exercise for those who love to play soccer. Baptiste Paul sets his story on an island in the Caribbean where such a field calls to the children and interested adults early in the morning. An invitation is issued to every player in the village, and soon they are on their way to get the field ready for a game. They have a ball (bol). They are wearing shoes (soulye). The goal posts are set. Oh, and the field is cleared of grazing cattle. Finally, it's a friend versus friend contest. Play begins and goes on and on, despite dust, wind and a rainstorm. Nothing stops them. Removing shoes and socks, they play through the storm, helping each other up from the mud and happy to play on when the rain stops. Only when mamas call them inside at the end of a long day do they quit. It's bath time and bedtime and sweet dreams about futbol. In an author's note, Baptiste Paul reflects on his childhood and the amount of time he spent playing futbol with his family and friends. He is reminded of that childhood whenever his own children play outside. He knows children learn a lot when they play on a team, and can overcome the challenges that face them together . He also discusses the Creole language spoken in the Caribbean, and used in his text. A glossary of words used and a pronunciation key are welcome. The full-out fun of playing the game is evident in the expended energy shown in the lively images created by Jacqueline Alcantara in her debut picture book. Constant movement, a verdant setting, bold colors and rich details add charm and context. "Why, a rustic setting like this would be the perfect place to find Hermes! He could help you keep an eye on your herd over there! Heh-heh. In all seriousness, though, perhaps it was Hermes's role as guardian of the flocks that led to his most-unusual child. And, to be sure, Hermes has had many unusual children." I think I have said this is previous posts: if I had had these graphic novels to read I might have remembered names and characters more easily. Oh, and actually to know more about the Olympians family tree which is displayed prominently before this book begins. This is George O'Connor's tenth book in the Olympians series, following books about Zeus, Athena, Hera, Hades, Poseidon, Aphrodite, Ares, Apollo, and Artemis. We can only hope that there will be more! Each is worthy of space on your library shelf, and you need no recommendation from me before purchasing every other one Mr. O'Connor pens. They are so good! Opening pages show the teller of our story, travelling with his dog and saluting a statue of Hermes as he passes. The plan has been to sleep outdoors, but perhaps a lone farmhouse will offer welcome. Trading entertainment in exchange for food and a dry place to sleep, the traveller begins his story. It concerns Hermes, son of Maia, the eldest and brightest of the Pleiades, and Zeus. Hermes is a trickster from birth. The first thing he does is steal Apollo's cattle. Angered, Apollo wants the rest of the gods to know that Hermes cannot be trusted and is destined to cause problems wherever he goes. Hera succumbs to Hermes and his charm. So, he is allowed to stay. Each new tale of the trickster adds information for interested readers who will be astonished to know all that Hermes has many duties - guard dogs, athletics, peacemakers, astronomy, calendars, writing, thieves and liars, language and eloquence, politicians, merchants of trade, hospitality, travel and boundaries, rustic divination and gambling, flocks and herds and those who watch over them. All in an effort to keep the trickster busy and out of trouble. Did it work? What do you think? 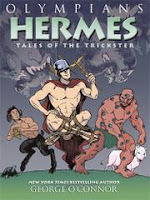 The many stories told, incorporating some that cover Hermes's son Pan (no surprise there) and references to other mythology, are full of humor and move quickly to ensure attention and connection. "Like his father, Pan is a protector of shepherds and their flocks. hearts racing and flocks to scatter." Backmatter follows, as is an expectation for this winning series. There is an author's note, a informative profile of Hermes, a glossary that links readers back to pages and panels, illustrated profiles that provide further information about Argus Panoptes, Pan, and Typhon, as well as a bibliography and suggestions for further reading. Exceptional! "Max gave Warren a thumbs-up, because that was the kind of friends they were. He watched Warren walk to the front of the classroom, He was wearing a black turtleneck and a red knit cap and square swimming goggles. On his back he had a pretend oxygen tank that he and his dad had made out of a plastic soda bottle and some tubing. 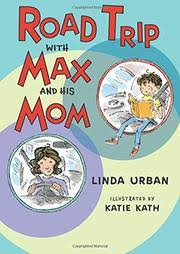 Warren pretended to take a breath ... "
Following up on her first story about Max and his family (Weekends with Max and His Dad (2016), Ms Urban continues with Max's long weekend trip to attend a family reunion with his mom. Their family is still making the adjustments required when parents separate. Max spends time with both parents, and is beginning to understand their need to be apart while knowing they also love and support him in all the best ways. Both Max and his mom have planning on their minds. Max is preparing a school assignment that requires him to portray a biographical figure in both costume and content. He has chosen awesome explorer Ernest Shackleton and his adventure in Antarctica. Mom is busy planning a weekend road trip that will take the two to Great-Great Aunt Ivory's 100th birthday celebration. She is making lists and insisting that it will an adventure both will enjoy. While Max is worried about not spending the weekend with Dad, Mom is reassuring and lets him know that Dad will be fine, they will have fun with her family at the amusement park, and they will get to experience The Big Buckaroo while there. While still at home, Max begins to think of his adventure in comparison to Shackleton's explorations and experiences, and then when he is with his cousins at the reunion. He recognizes that there were things Shackleton did not accomplish, but those that he did were of great importance. That helps Max make a decision about the Big Buckaroo and the fear he feels concerning the ride. Serene in tone, humorous, endearing and filled with love for family, this is a welcome addition to tales concerning Max and his parents. It is perfect fare for kids graduating to early chapter books and gives them a worthy character to emulate. "Mom put her hat on her head. Max straightened it. Mom laughed. "Together We Conquer!" she said. "Or at least, Together We Get Our Hats on Straight. How's that for a family motto?" This is the PIG ... "
I have always looked forward to a new book from Denise Fleming. Many of our favorites when the kids were young were authored by her. 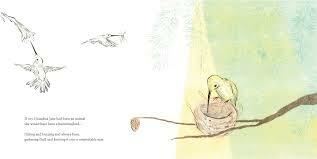 In this cumulative tale, she celebrates the tenacity of one of my favorite birds - the robin. Every spring, I am delighted to hear robin song and know they are here to rebuild their nest on top of a service cable box on the back wall of my house. Fun to watch as they build, lay eggs, rear their young nestlings and, if I am ever lucky enough, watch those fledglings take their first flight - and be gone! 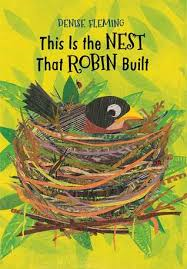 In this cumulative tale, Ms. Fleming notes that the robin gets help from a number of animal friends to ensure the structure and safety of the nest that will be home to a new clutch. A squirrel provides twigs, a dog string, a horse shares straw, a pig mud, a mouse seedy weeds, a rabbit grass ... all in preparation for the three blue eggs that will fill that space and become a new family in quick time. 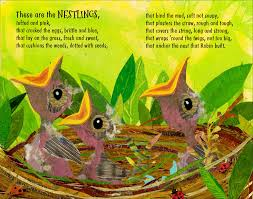 Using lovely alliterative, rhymed-filled text to describe each animal's contribution to the build, she builds an engaging repetitive story worthy of repeated readings. The gorgeous artwork uses a new technique that combines original printmaking techniques prior to being assembled in collage images. The textures evoke the many natural materials used to build this very special nest, and the colors are breathtaking and real. Young readers will love searching for the tiny ladybugs on each spread, and will very much appreciate the foldout that reiterates the process leading to the birth of three tiny nestlings. They will also feel joy at watching the fledglings leave their nest to make their own way in life. Mama's work for this spring is done! Lively, celebratory and infinitely rewarding. This one is easy. Set a timer for five minutes. At the top of the sheet of paper, write the words "I Remember." For five minutes, list as many things as you can that you remember. They can be good memories, bad memories, funny memories ... "
I was happy to share this guide for young writers in workshops that I presented this month. 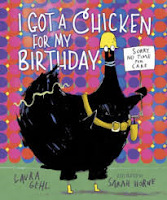 It is a great mentor text, giving teachers and their students a way into trying their hand at guided writing. It should also encourage them to consider creating prompts of their own for themselves and their classmates to use. It began with Colby Sharp, a fifth grade teacher from Parma, Michigan. 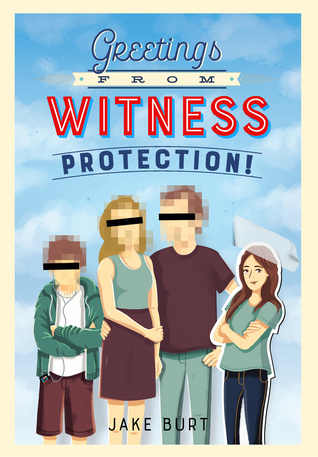 He invited 42 authors and illustrators to provide two writing prompts. These were then given to another person from the group to use as inspiration for a short story, poetry, a comic, or an art piece. After choosing one of the prompts, the remaining one was returned to be placed in a section at the back of the book for consideration by those who buy and use it. Choice is at the heart of the assignment. This was my introduction to Colby, and I have followed his work since then. His dedication to children and the books they read is exemplary and has led him to learn more and more as he attends conferences, plans NerdCamp every summer and contributes to a podcast called The Yarn. I was keen to see this project completed, and am happy to be able to share it with you. The responses are as varied as the contributors themselves. The inspiration that can come from their work for young and aspiring writings is limitless. This one comes from Kirby Larson. Why don't you try it? for your family and spy a letter leaning against the box of Cheerios. You open it and this is what you read: "
Back matter provides a quick biography for each contributor. way to 10! Don't even get me started on 10. Everyone thinks he's perfect!" 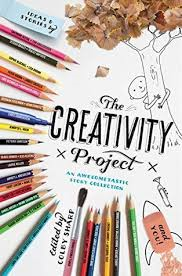 on cloud nine right now ... "
I read this book to two groups of teachers this month. I also read it to two groups of kids. Same effect: laughter, conversation, high interest. 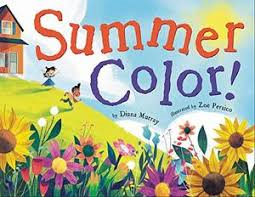 Rather than add it to a general list of new picture books, I added it to the list specifically designed for older readers. As I have said before, I think we need to look carefully at the ages publishers suggest for interest level. Many picture are much more appropriate for older readers, rather than the 4-8 year olds often touted as the reading audience. We definitely do not want older readers to buy into the premise that picture books are not suitable for their reading pleasure and interest. Little ones would not appreciate or understand the 'punny' language concerning math presented here. All that being said, this is a terrific math mystery narrated by Private I. His client? A terrified number 6. He's in need of help to find 7, who is after him because he has already eaten 9. "Well, technically, he's always after you,"
I said. "There's 5, then 6, then 7." It goes on and on, one perfect pun after the other - all referring to numbers and number concepts. It takes some time, but I gets to the 'root' of the problem. 9 has disappeared, and I is on the lookout for the perpetrator, 7. When he discovers that 7 is on vacation, his search takes a turn. I rushes back to his office, confronts the counterfeit 6 and demands an explanation. 9 is furious with 7 and all the attention he gets, and wants him to pay the piper. I can't believe it! "I zeroed in on 9. Are you kidding? You should be on cloud nine right now. Happy as can be, the whole nine yards!" "Because you've got NINE lives!" Much too complicated for most little ones, don't you agree? Detective speak, nostalgia-laced artwork, and clever writing make this a book to be enjoyed many times over. The artwork is created 'using colored pencils, watercolors, and 19th-century wood type, then composed digitally using Photoshop.' Makes for a film noire vibe and includes many fine details that the most observant readers are sure to point out. Mystery solved. Don't miss it! 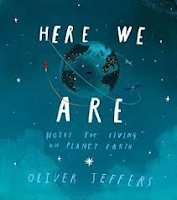 sea, but we'll talk ... "
Having recently celebrated Earth Day, I was reminded of Oliver Jeffers' book, written to celebrate his first child's birth in July 2015, and his first two months living in this place we all call home. sense of it all for you. I think you need to know." Every image, created digitally, focuses on Earth: its place in the galaxy, its flora and fauna, its land and water, its days and nights, the passage of time spent here, and the work that is still ahead to make it the best home it can be. Suggestions are made for living well, caring about the Earth and those who share it. There is enough for everyone." The audience is a baby. The message is clear: I will be here for you. If I can't be, there will be someone else to answer your questions. You are never alone. A much needed reminder at this time on our planet, don't you think? a thing. The flowers were blooming. The sun was shining. The birds were singing. This last bit - about the birds - was especially good because adventures usually involved some kind of trouble, and it's nice to have a little birdsong to help you through it." Two good friends who are sheep, and a wolf in sheep's clothing. Sound like a premise for a story you might like? If you answered with a resounding YES, you are absolutely right! First, the sheep. Wooliam is a reader. Baabwaa is a knitter. Practical and useful, they like the way their pursuits help their days pass. 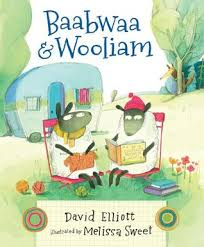 The sedate life changes significantly one afternoon after Wooliam reads a tale of high adventure, and suggests to his friend that it might be good for them to attempt such an undertaking. Baabwaa is agreeable. Soon they are off, ready for whatever comes their way. Or are they? As they wander, they enjoy the sights and sounds of a sunny walk. There is a problem. They realize the stone wall that surrounds their field is not conducive to grand adventure. Hungry and tired after their unaccustomed foray into nature, they pause to munch some lunch. Only then does the third sheep appear. "A sheep with a long, rangy tail. A sheep with a filthy wool coat." Remember - Wooliam is a reader, and not about to be fooled. The two run in the face of terror, only to be stopped when the wolf advises he is keen to know more about the idea that Wooliam has read about a wolf such as himself - 'a wolf in sheep's clothing.' Of course, Wooliam is happy to take the book from his backpack and show it to the wolf, who cannot read it. 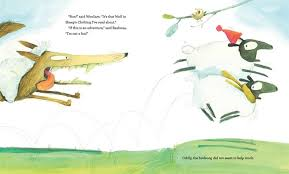 Baabwaa, who is exhibiting motherly feelings toward this wolf with unclean teeth, a filthy coat and the inability to enjoy a book about himself, offers a solution for his reading problem. Wooliam will be his teacher. and chased the two sheep around the field. This irritated Wooliam no end." Quite the adventure, after all! The illustrations, created in watercolor, gouache and mixed media, are outstanding and add to the delightful drama of the tale. 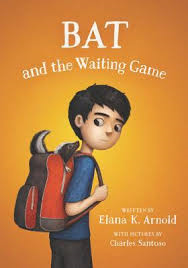 Expressive characters, exemplary page design and full of the humor that will delight readers and listeners, this is one terrific read aloud tale. that makes nine - "
What a calm and lovely book this will be for bedtime reading. After all, it is the sleep train. The title page allows an inside look at the bedroom where a young boy and his stuffed bunny are reading a book, appropriately the exact one we are about to read. An expanded view of his room at the page turn offers up a bit of information about him. He loves balls, books, farm animals and old train cars. And reading! Another page turn and the gentle words describing the sleep train pull us in. That first spread shows the entire train making its way slowly over a bridge out of the city where the young man lives, and into the quiet countryside. The next horizontal spread shows the train and each of its ten cars rolling past grassy plains. The sky is pink and gold; the message is clear ... night is coming. The train's cars are named as it makes its way past a lone elevator and into the beauty of sunset. Passing cows in farm fields, a train station, and the starry night sky, the train rolls on. Ah, but who is in that sleeper car? The young man, by now finished reading his book, imagines himself counting the train cars, once and then again. All the way to sleep! An explanation for the illustrative work done to create these awesome digitally manipulated photographs is extensive and can be found on the copyright page at the front of the book. Each spread is detailed and beautifully designed, inviting readers to pause and consider every carefully constructed piece. 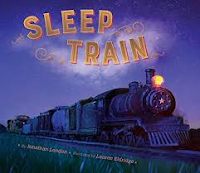 The rolling rhythm of the train is captured in the soothing rhymes of a spoken lullaby, as the sky darkens and sleep comes. "Tom put the car in park and turned it off. "Here we are," he said, which normally would have prompted Bat to say something about how that was the kind of statement that really didn't mean anything, because it's always true - you could always say "Here we are," no matter where you were, and you'd be right. But Bat didn't point that out, this time. "Thank you for driving us," ... "
It has only been a short time since I introduced those who read this blog to Bat. We learned that he is an autistic school student, whose parents are divorced, whose sister is older and works hard to understand and appreciate him, whose friend Israel is a true friend indeed. Oh, and Bat loves skunks, knows a lot about them and is learning more every day as he is caring for skunk kit his veterinarian mother has rescued. Thor, the skunk, is growing and becoming the skunk he is meant to be. That means, he is developing an ability to protect himself. As Bat continues navigating a new friendship, accepting his father's wishes for him to try to appreciate some of the things that his father likes to do, accepting his sister's more complicated schedule since she got a role in the school musical and the changes that means for Bat himself, he also needs to be aware of Thor's growing needs. His mom, his teacher and Israel remain helpful when Bat feels his control slipping. We know he handles things differently, but that is not the focus of Bat's story. Every family faces its own set of challenges, and Bat's does the same. Bat remains concerned about the skunk and his upcoming release, as he wants Thor to be prepared for life in the wild. Because he doesn't want him to be alone, Bat tucks Thor into his shirt and takes him to Janie's play. Wrong decision ... oh, so wrong! Fans will be anxious to read this next chapter for Bat and Thor, and happy to know that another is in the works! For kids and adults interested in earth science, this book explores the wonder of geology. 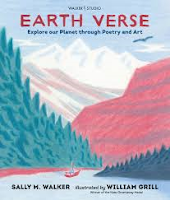 Using the economy of the haiku poetic form, Sally Walker pens 29 poems that begin with the planet Earth itself and move on to the many features that make its geology worthy of study and wonder. There is such richness in the descriptive (and, at times, unfamiliar) word choice. The author explores cataclysmic events, and natural formations. Making meaning for scientific fact in so few words is quite the accomplishment. I found them to be both fascinating and informative. a gull wears sand socks"
William Grill's colored pencil artwork provides a worthy accompaniment to the succinct poems. In relaxed depictions of what is in contained in the poetry, he gives a sense of place and portrays the actions of the earth. In the bottom corner of each illustration is one symbol of nine presented - Earth, minerals, rocks, fossils, earthquakes, volcanoes, atmospheric and surface water, glaciers and groundwater. Back matter provides a section to include more information about each. A list of suggestions for further reading will encourage those wanting to know more to do just that.